Guimaras is most famous for its mangoes. It seems logical then that its people will try incorporating it into all kinds of dishes and treats... even pizza. 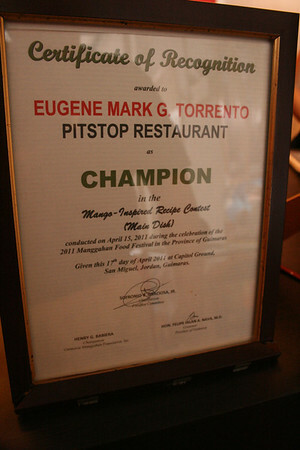 Mr. Eugene Mark Torrento won for Pit Stop Restaurant the 2011 Best Mango-Inspired Recipe Contest (2011 Manggahan Food Festival) for his Mango Pizza topped with Cashew Nuts. 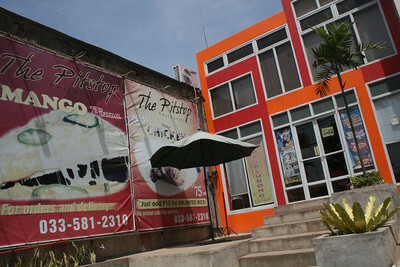 It is no suprise, then, that travellers to the island of Guimaras would make sure to stop by the restaurant for a taste. In all honesty, I was VERY doubtful I'd like it since I don't like my fruits cooked or mixed with bread or other stuff (yes, I don't even eat halo-halo or fruit salad). But I decided that we may never go back to Guimaras so I might as well try it once. Plus, since it's mango season, I figured I would at least get to taste it with the fruit at its best. Sigh. Suffice it to say, I now believe can eat a whole pizza if it isn't too filling as well. The crust itself is thin. 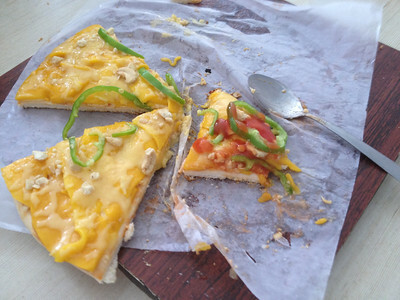 It's topped with some light cream/cheese-based sauce then mango slivers, green bell pepper (which gives it the smell/flavor of pizza), very mild cheese and chopped cashews. Nothing spectacular, right? But it really surprisingly works... and the more you eat it, the more you love it. I think i'd love some more salt (cheese) in it but it really was great as it was. I didn't try putting ketchup on it but everyone else did, and they all said it tasted even better. Imagine mango on pizza with ketchup... hard, right? But hubby, who grew up feasting on pizzas at midnight, swears by it. The best time to go the Pit Stop is coming from Jordan Wharf to your resort/hotel (order it 'to go' and have it in your hotel room as your first Guimaras feast), or when you're on the way off the island. Just ask your driver nicely so that they won't charge you extra anymore for the stop. The Pit Stop seemed like part diner, part bar too, since it offered Pepsi floats and beer and chicken adobo with a twist (mango is involved again) and burgers. It also offered pasta, so definitely a restaurant that can cater to your gastronomic desires away from home. 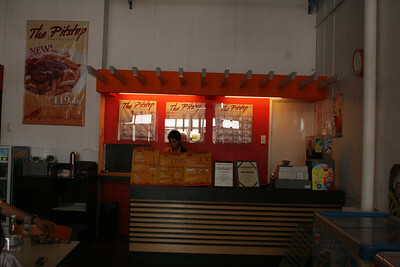 For the family-sized mango pizza, two Pepsi floats and a cheeseburger, we paid around P340. And the pizza was really filling... and a definite must-have again. Oh ho! 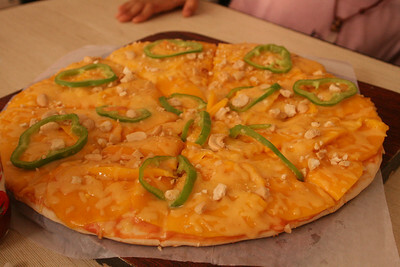 A mango pizza! I must try this if and when I go to Guimaras :) Thanks for sharing this!